Farm Employers and Job Seekers meet at the FarmWork Job Fair! Farm employers and hopeful job seekers gathered in Peterborough on Friday at east central Ontario's first FarmWork Job Fair. Attendees heard advice from a panel of farm employers on how to ensure that hiring decisions benefit both the employer and farm worker. Presentations on employment standards, WSIB and health and safety considerations on the farm informed participants on these important topics, and provided resources to find more information. Farm employers came from far and wide, travelling from as far as Prince Edward County, to fill up to 60 job openings. About 75 job seekers registered for the event from Trent University, Fleming College and the wider community, in hopes of finding on-farm employment. The day was a great success and Farms at Work looks forward to hosting the job fair again next year! Thank you to Agri-Food Management Institute for funding this event, and to our generous sponsors, Durham Region Economic Development and FoodWork.ca. To hear more about the FarmWork Job Fair, check out this article in the Peterborough Examiner. KFSC Farm Stewardship Day: Register Now! 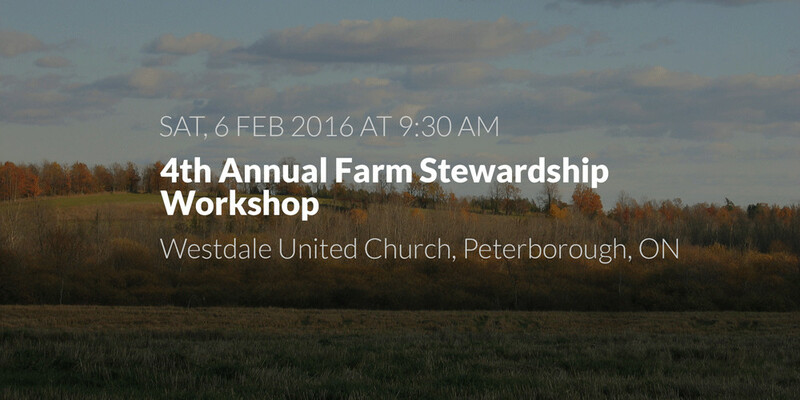 The Kawartha Farm Stewardship Collaborative (KFSC) invites farmers and rural landowners to attend the 4th annual Farm Stewardship Workshop on Saturday February 6, 2016 at Westdale United Church in Peterborough. Don’t miss this opportunity to hear knowledgeable speakers on current topics! Doors open at 9:30 AM, program starts at 10:00 AM. Ticket purchase includes a hot lunch. Satellite farm maps will be available on request at no charge. Register online at www.kawarthafarmstewardship.org, or contact Farms at Work at info@farmsatwork.ca or at (705) 743-7671 for more information.